On Monday, Jules Birch wrote a post questioning George Osborne’s choice of venue in which to claim the economy is ‘turning a corner‘. Was, Birch wondered, a luxury development on the edge of the Square Mile, arguably dependent by degrees on debt-fuelled government schemes, wealthy overseas buyers and ‘life support’ interest rates really symbolic of the ‘tentative recovery’ the Chancellor declared it to be? The glossy, contrived picture – for all Osborne’s talk of ‘an aspirational society’ so distant from the lived experiences of most Britons, let alone those at the sharp end of coalition policies – is a succinct visual representation of fears that Britain is returning towards a precariously balanced economy in which wealth inequality is given free rein. Yet the work done by this image does not stop there. Equally striking are the gendered messages it transmits. On the left we have the immaculately groomed and clad young, implicitly able-bodied, white male. He stands afront a skyscrapered backdrop, gazing with quiet assurance at the opportunities which everything about his appearance tell us are his for the taking. This man, the slogan states, is ‘City’. (No pressure gents). His opposite number is ‘Fringe’. Fringe, the dark shadows of her image suggest, comes out to play at night – presumably when City, pictured in broad daylight, can take a break from all that fiendishly complex finance-type work. We don’t know what Fringe gets up to during the day, but what is clear is that once darkness falls she doesn’t seem to need to wear clothes. Some strategically placed jewellery, some slap and an elegant hair-do are all the adornment she needs. Those and an alluring pose. It is easy to dismiss iconography that portrays gender stereotypes as unimportant, so removed is it from most of our realities (as Birch infers). Yet public awareness and opinion cannot remain untouched by the proliferation of such images, whether or not we are in the market for whatever they are selling. This example is particularly pernicious given the powerful combination of juxtaposed imagery and the taxonomy of its slogan. The latter provides a blunt reinforcement of unbalanced gender relations, identifying the man with ‘City’ – denoting wealth, power and status – and the woman with ‘Fringe’, suggesting ‘peripheral, decorative and marginal’. Such powerful effects are among the reasons to query another blog post which appeared this week: Ed West’s defence of ‘Princess Pink’ toys for girls. West pits ‘ideology’ (as espoused by those who challenge gender stereotyping) against ‘business plans’ (‘capitalism has no ideology’, apparently) to argue that there’s a market for gender specific toys because most little girls like feminine things. ‘You can’t buck human nature,’ reads West’s provocative conclusion. There are various problems with his argument, not least the failure to consider gender a social construction rather than a ‘natural’ given. Our ideas about gender and human nature come from somewhere; they are regenerated and reinforced by images like the one above – particularly when drawn to our attention and sanctioned as a positive economic symbol by a senior government figure. Likewise, West’s ‘business plans’ are not created in a vacuum. 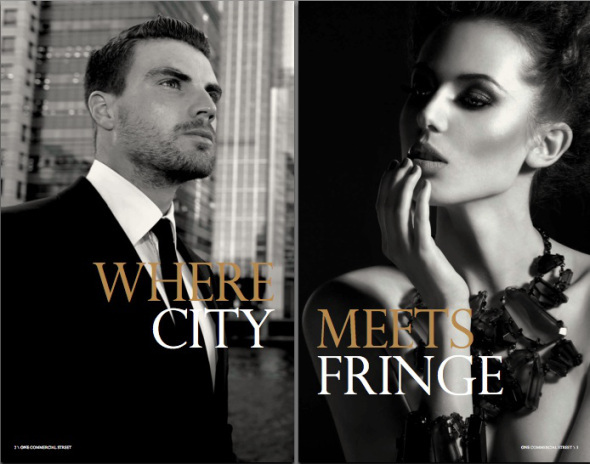 After all, the people designing, financing, marketing, selling and buying the toys are not immune to the countless ‘City meet Fringe’ messages that surround our daily lives and have their roots in centuries of ingrained thinking and socialisation as ‘men’ and ‘women’. Just as Birch is critical of the Chancellor’s choice of the place ‘Where City meets Fringe’, so too we must move beyond a blind acceptance of the surface messages which constantly shape ideas about gender and, ultimately, our society. This entry was posted in Blog, Uncategorized on September 11, 2013 by Caroline Thorpe.